Vibe Reservations provides all the key functions you need to support your Reservations Call Centre. If you make extensive use of Vibe’s capabilities to offer a number of rate plans and special promotions it can sometimes mean that a partner or customer may be presented with a number of possible rates for a single request. For some customers or new partners this might be too much information to cope with. In these scenarios you can utilise Vibe’s ‘Best-Buy’ capability to only show the lowest qualifying rate. Provides customers with an assurance that you are offering them the lowest available rate in your system. Avoids any confusion that can arise from aggressive marketing using special rate plans and discounts. Regardless of the channel through which reservations arrive (Vibe, Web or XML), Vibe has the ability to automatically process credit card payments in real-time. We can work with your existing payment gateway provider or we have modules that allow Vibe to work with a number of providers out of the box. When a Quote or Provision is saved Vibe assigns a date and time at which these requests will be automatically expired. However, you can configure Vibe to produce an automated email follow-up, prior to expiry, for either the partner or customer, so that they are reminded of the impending expiry. Pricing and validity rules are properly enforced. Inventory allocated to Provisions is freed for sale to other customers as soon as possible. Improves the acceptance rates of Quotes and Provisions offered. Some customers appreciate the opportunity to progress their reservation through an automated sales process. Regardless of how the original customer request (e.g. Quote or Provision) is created, Vibe can incorporate Self-Service Hyperlinks into the documents it produces. 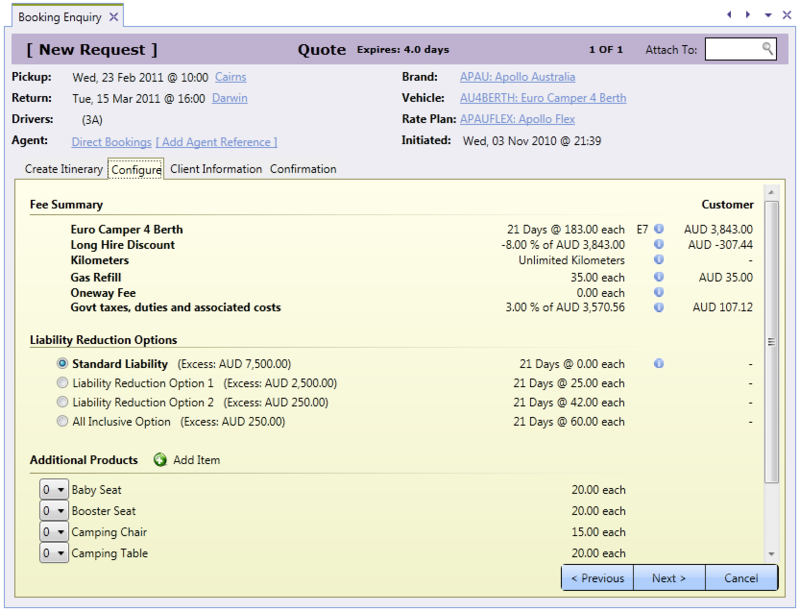 For example, in a Quote document or email produced out of Vibe you can incorporate a ‘Proceed with Reservation’ link. This enables the customer to click on this action and be taken directly to the Vibe B2C engine where they can utilise self-service screens to complete the reservation process. Currently such hyperlinks are available for Reservation Confirmation, Customer Preregistration, Payment Processing and Special Offers and the list is growing as customers increasingly become more familiar with self-service. Where customers are happy to choose self-service options, staffing costs and customer wait times are reduced. Greater flexibility for customers and partners to interact with the business. Reduced data errors as customers and partners take responsibility for recording their own data. Hot Deals are specials that are restricted to a certain number of vehicles. Hot Deals can also be restricted by pickup or return locations, vehicle type, pickup dates, bookings dates and so on. Hot Deals can also be directional to assist you in moving fleet from one set of locations to another (e.g. from East to West, or North to South). Vibe allows you to present a searchable list of Hot Deals for your customers to book instantly over the Web or for your Reservations staff to sell from your call centre. Vibe ensures that you sell no more than the number allocated regardless of the channel. Encourages bookings to reduce capacity at depots with surplus vehicles. Promote Hot Deals directly to targeted partners and customers with instant bookings.